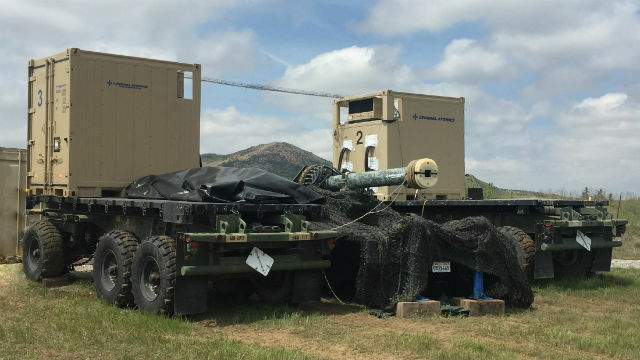 A General Atomics division has successfully demonstrated giant storage capacitors that can power hundreds of shots by futuristic electromagnetic railguns. The San Diego-based company said its new capacitors can store more than 415 kilojoules of energy, breaking a previous record by more than 20 percent. Railguns use electromagnetism to accelerate projectiles without explosives. The Navy anticipates using railguns on its new Zumwalt class of stealth destroyers. General Atomics said two of the new capacitors were used to successfully demonstrate 500 railgun shots in a repetitive-fire mode. “Our ongoing research, development and maturing of high energy density capacitor technologies is enabling the creation of pulsed power systems powerful enough and compact enough to support the needs of our customers for both land and sea-based railgun applications,” said Nick Bucci, vice president of missile defense and space systems at General Atomics’ Electromagnetic Systems Group. Bucci said the more powerful capacitors will enable General Atomics to design more compact railgun weapons. The company has successfully fired projectiles from its Blitzer electromagnetic railgun at accelerations of over 30,000 times the force of gravity. This new capacitor will enable significantly higher muzzle energies.